two weeks of art and performance at Workplace Gateshead as part of TUSK Festival 2017. 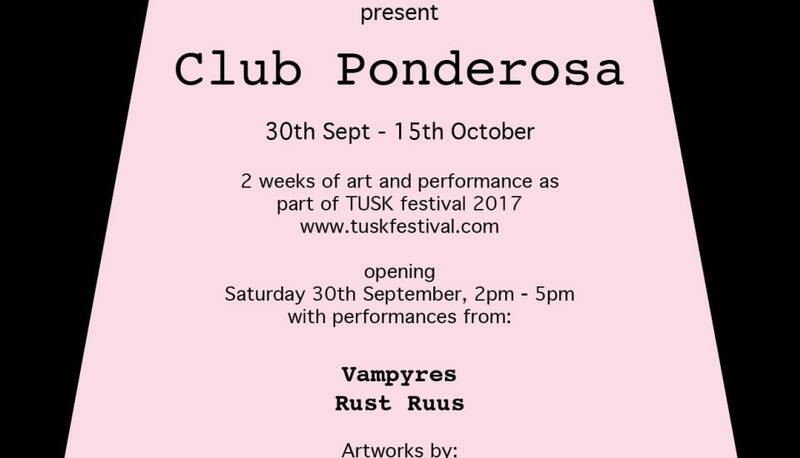 Club Ponderosa is a temporary hybrid space originally designed by artist/filmmaker Matt Stokes to operate as part meeting house, nightclub, theatre, village hall and social club. Sited within the environs of Club Ponderosa are new and existing artworks by Steven Stapleton, Graham Dunning, Kate Widdows, Joincey, Juneau Projects and Vile Plumage. The exhibition opens on Saturday 30th September at 2-5pm with live performances Vampyres and Rust Ruus and will conclude during the weekend of TUSK Festival, on Sunday 15th October at noon with performances from Archipelago and BRB>Culver. This project has been co-curated by artists and musician Rachel Lancaster.